BUCCO BOB, BIG!! ASSONANZA - BEST BREEDING GROUP!! BRIXI with BEETOWEN res. BIS couple!! 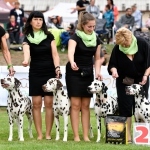 ASSONANZA – BEST BREEDING GROUP! !